1. 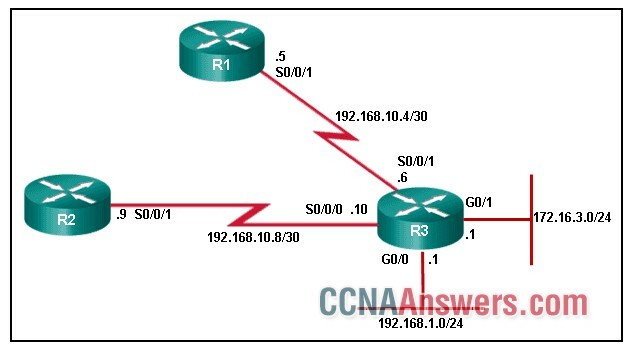 In which scenario will the use of EIGRP automatic summarization cause inconsistent routing in a network? 2. Refer to the exhibit. An administrator wants EIGRP on Router1 to load balance traffic to network 2001:db8:11:10::/64 across two interfaces. Currently traffic is using only interface GigabitEthernet0/1. A second route, not in the routing table, is available with a metric of 264000. 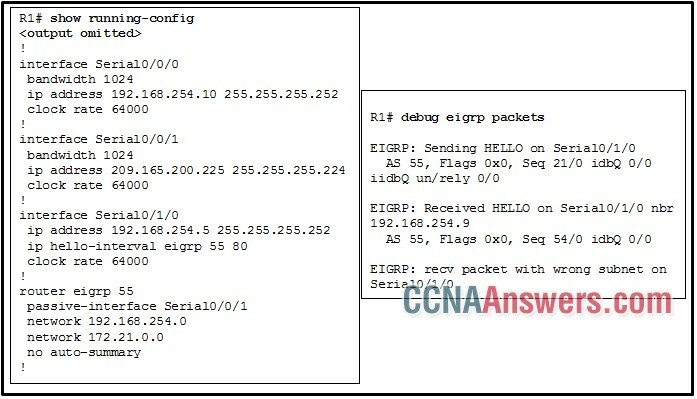 What value is needed in the variance command to make EIGRP put the second route into the routing table? 3. Refer to the exhibit. After the configuration shown is applied on router R1, the exhibited status message is displayed. 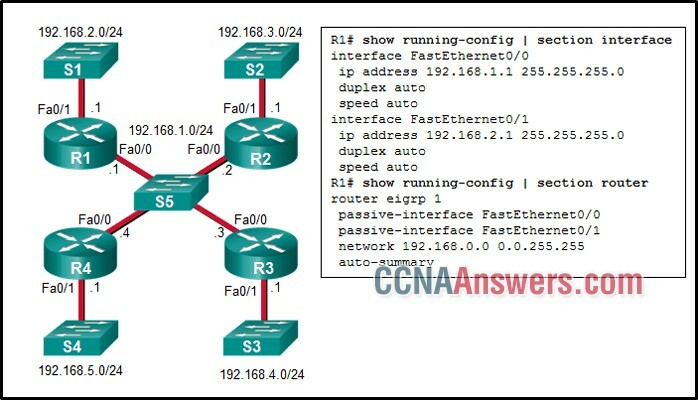 Router R1 is unable to form a neighbor relationship with R2 on the serial 0/1/0 interface. What is the most likely cause of this problem? 4. 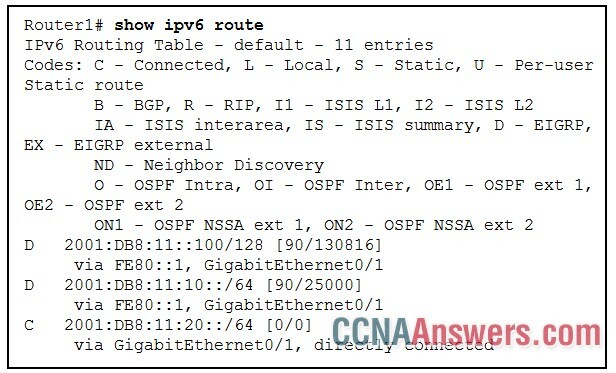 What is the administrative distance of externally learned EIGRP routes? 5. By default, how many equal-cost routes to the same destination network will EIGRP install in the routing table? 6. What is the default maximum amount of bandwidth that can be used for exchanging EIGRP messages on an EIGRP-configured interface? 8. Two routers, R1 and R2, share a 64 kb/s link. An administrator wants to limit the bandwidth used by EIGRP between these two routers to 48 kb/s. 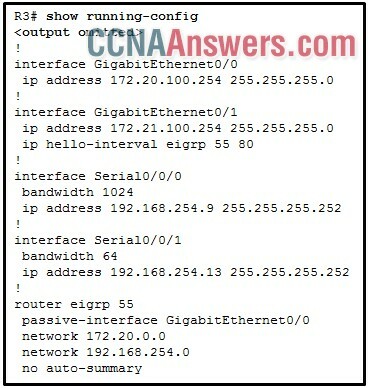 Which command is used on both routers to configure the new bandwidth setting? 9. Fill in the blank. Do not use abbreviations. The passive-interface command causes an EIGRP router to stop sending hello packets through an interface. 10. Refer to the exhibit. Routers R1 and R2 are directly connected via their serial interfaces and are both running the EIGRP routing protocol. R1 and R2 can ping the directly connected serial interface of their neighbor, but they cannot form an EIGRP neighbor adjacency. What action should be taken to solve this problem? 14. 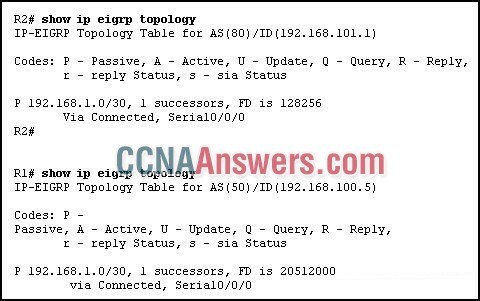 Assuming that EIGRP is enabled on both routers and automatic summarization is enabled, what must be configured to ensure that R1 will be able to reach the 2.2.2.0/24 network? 15. Which command can be issued on a router to verify that automatic summarization is enabled? 16. What is the purpose of a Null0 route in the routing table? 18. When a Cisco router is configured with fast-switching, how are packets distributed over equal-cost paths? 19. Open the PT Activity. Perform the tasks in the activity instructions and then answer the question. R1 and R2 could not establish an EIGRP adjacency. What is the problem? 20. Refer to the exhibit. Considering that R2, R3, and R4 are correctly configured, why did R1 not establish an adjacency with R2, R3, and R4? 21. Refer to the exhibit. 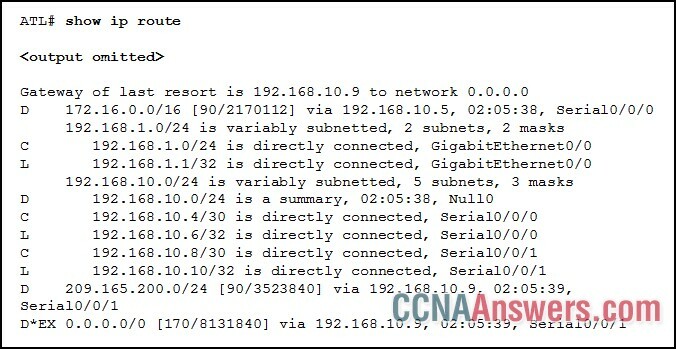 Remote users are experiencing connectivity problems when attempting to reach hosts in the 172.21.100.0 /24 network. Using the output in the exhibit, what is the most likely cause of the connectivity problem? 23. 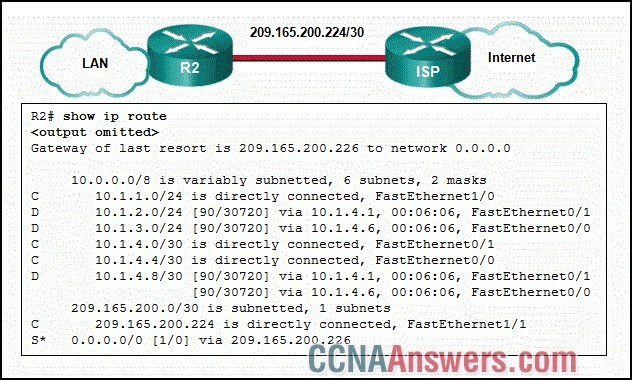 Which routing protocol supports unequal-cost load balancing on Cisco routers? 24. Which statement is supported by the output? 25. Refer to the exhibit. Router R3 is receiving multiple routes through the EIGRP routing protocol. Which statement is true about the implementation of summarization in this network? Automatic summarization is enabled on neighboring routers.